The MMM Elementary Skills are for use by young students - second or third grade. NOTE: The apps are designed for the android smart phone or tablet, but they can be viewed online on the desktop computer or any tablet or smart phone. Each lesson in the MMM Master Series provides drills on ONE single mathematical skill. The lessons are brief and simple with emphasis on repetition to increase speed and long term permanent memory. Table Master presents practice on two of the most important primary skills - the basic multiplication and addition facts. Count Master presents exercises on counting and number sequences. 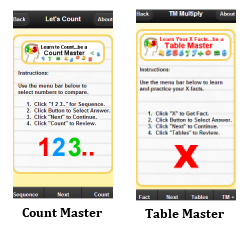 Order Master presents practice on number comparison using the correct order symbols. With frequent use, the Master drills will ensure that these facts will be committed to memory, become automatic, and provide a firm base for continued study. Say 20 is a simple little puzzle with a mathematical basis that challenges the player to figure out why he always loses. Euclid is a geometry primer that covers five basic topics in a casual manner. Each chapter includes a self quiz and there's a final exam at the end. Euclid is available on the Amazon Appstore - Search > Games & Apps > Euclid. 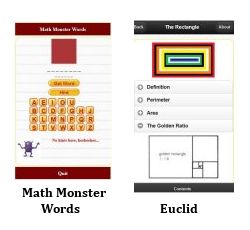 Math Monster Words is similar to the pencil game "hangman". Blanks represent mathematical words which must be guessed and spelled in six attempts or the math monster will appear. Mini-Bunco explores the probabilities of dice rolling. Several simulations are presented to test the probabilities. 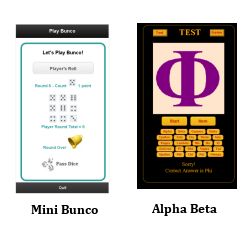 The parlor game of Bunco is presented [in miniature to save time] and buncos and bunketts are tracked. AlphaBeta teaches the player to recognize and name the letters of the classic Greek alphabet. Squares is a game of concentration with four levels of difficulty. Player clicks squares to find pairs of solid color and patterns. "Thirteen" is a solitaire card game also known as "Clock Patience". Sim3 simulates a computer excecuting an assembly language program. It allows the user to write assembly programs in a mini-mock assembly language and watch the "computer" execute the program line by line. These are mobile WEB apps. They are being developed with web technologies. They begin life as mini-web sites and are subsequently converted to the android platform. For the novice would-be android web apps builder ==> Here's How it Works. Lakewood Ranch, Florida 34202. All rights reserved.